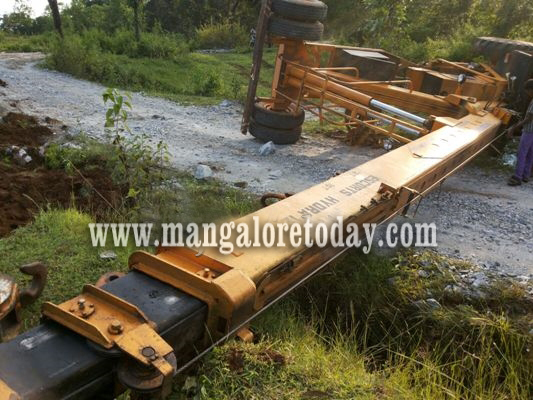 Kundapur , Nov 06, 2015: The driver of a tipper met a tragic end when a crane that had arrived to lift his vehicle which had landed in a roadside ditch, fell down, crushing him to death. The mishap took place near Chatarekallu in Amasebail on November 5, Thursday. The deceased is Rama alias Krishna (33) of Tharikatte. The tipper loaded with boulders from a quarry which was being driven by him had landed in a roadside ditch following which a crane from Kodgi granite had arrived to lift the tipper. Rama was assisting in the operation when the crane fell down over him resulting in his death. The crane was later moved using another Hitachi mover. The body of Rama was handed over to his family after a post mortem. Rama is survived by his mother, wife and two little sons. He was the sole breadwinner of his family. A case has been registered by Amasebail police.